LAKE HAVASU CITY, Ariz. — As part of efforts to keep Arizona’s lakes and waterways safe for all users, the Arizona Game and Fish Department was part of a multiagency operating under the influence (OUI) checkpoint July 22 on Lake Havasu. The four-hour operation resulted in three people being arrested for OUI. Although the legal limit for operating a boat in Arizona is a .08 blood-alcohol concentration, an operator is in violation of the law and may be prosecuted for operating a watercraft while impaired to the slightest degree by alcohol and/or drugs. The checkpoint was done in coordination with the Mohave County Sheriff’s Office, U.S. Fish and Wildlife Service, and Bureau of Land Management, and 245 boats and personal watercraft passed through it. In addition to the OUI arrests, 43 citations were issued for violations like having an insufficient number or type of personal flotation devices. Not having a fire extinguisher accounted for the greatest number of violations (19), followed by not having a type IV throwable personal flotation device (14). In 2016, alcohol was a contributing factor in three of the five recreational boating fatalities in Arizona and in 2017, alcohol has contributed to four of the six fatalities that have already occurred. 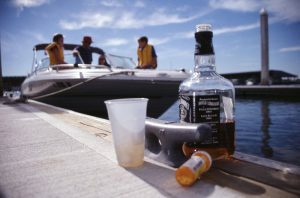 Nationally, the U.S. Coast Guard reported that alcohol was the leading contributing factor in fatal boating accidents last year. The Arizona Game and Fish Department’s boating safety education team was at Lake Havasu in advance of the checkpoint providing information to boaters and making sure their vessels were properly outfitted with safety gear. Resources that were distributed included a handbook about laws and responsibilities for Arizona’s boaters and information about how to stay safe during monsoon season. “Our goal is to ensure that everyone has the necessary safety information in order to have a great day out on the lake,” said Josh Hoffman, boating safety education coordinator for the Arizona Game and Fish Department. It’s recommended that all operators take a boating safety education course, and watercraft users review all regulations prior to launching. Operators must have a U.S. Coast Guard-approved life jacket for every person on board and make sure that anyone 12 and under is wearing one at all times. Boats must be equipped with a fire extinguisher, and boats 16 feet in length or longer must have a type IV throwable personal flotation device on board and readily accessible. Each person on a personal watercraft, like a Jet Ski or Wave Runner, must wear a U.S. Coast Guard-approved life jacket with all fasteners and closures secured according to the manufacturer’s design and recommended use. Each person being towed behind a vessel on water skis or a similar device must wear a life jacket.